Venezuelan opposition leader Juan Guaido, whom a number of nations have recognized as the country's rightful interim president, talks to the media after attending a religious service in Caracas, Venezuela, Feb. 10, 2019. "There are people responsible for this and the regime knows it. 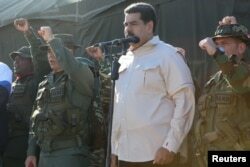 This is a crime against humanity, men of the armed forces," Juan Guaido said. 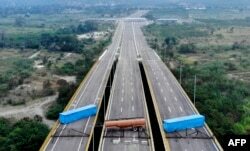 He directed his comments at soldiers deployed to a bridge connecting Venezuela with Colombia. Maduro has said the U.S. help is part of a plot to overthrow his government and said Venezuela doesn't need it. Maduro appeared on state television Sunday, showing off anti-aircraft systems and other weapons he says will make Venezuelan cities "impregnable." "We are a pacifist people as long as no one messes with us, that Donald Trump does not threaten us," Maduro said. "Donald Trump, get out of Venezuela. Out with his threats. There are armed forces here and a people to defend the honor, dignity, and decorum."